When Dobby joined her family when she was just a puppy three years ago, her parents and dog siblings were so excited to have her. They joyfully welcomed her into their family and immediately fell in love with her — but only two days after arriving in her new home, Dobby got very, very sick. 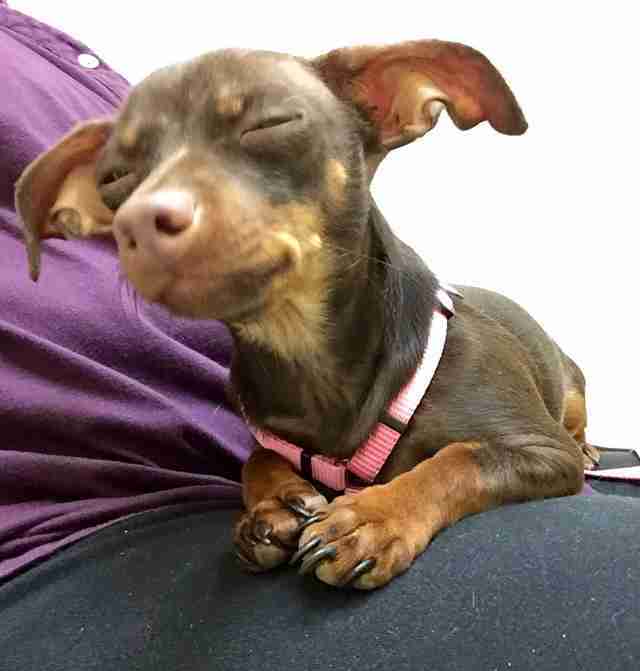 After taking her to the vet, Dobby’s new family was absolutely crushed to discover that she had parvo. Parvo is a very contagious, very aggressive virus that affects puppies, and is common in dogs who come from puppy mills or pet stores. to give up on the tiny sick puppy. 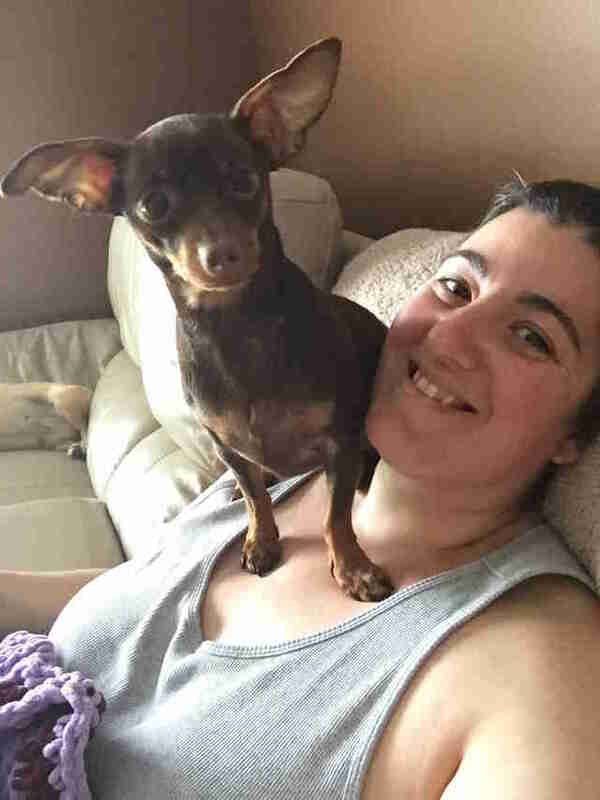 Determined not to lose hope, Dobby’s parents brought her home and set her up in her own room away from the family’s other dogs so they wouldn’t become infected as well. They brought her home on a Thursday, and the vet said if she could last until Monday, then she would likely pull through and make a full recovery. For five days, the couple sat in the room with Dobby, doing everything they could think of to make Dobby as happy and comfortable as possible. While she was fighting the virus, her parents decided to buy her a special toy to keep her company in her quarantine room: a stuffed pink bunny. From the moment she laid eyes on the bunny, Dobby loved it so much. It became her special buddy, sitting by her side every moment and bringing her so much comfort and joy. 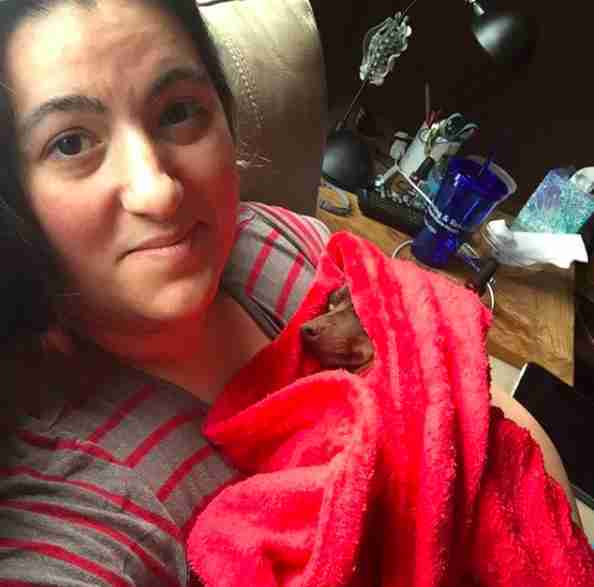 “She demanded it be in her special blanket, and when she could be induced to eat, it came to the bowl with her, it was adorable,” Coppa said. Finally, Monday came and went — and Dobby made a full recovery. Her family was absolutely elated, and so were Dobby and her pink bunny. 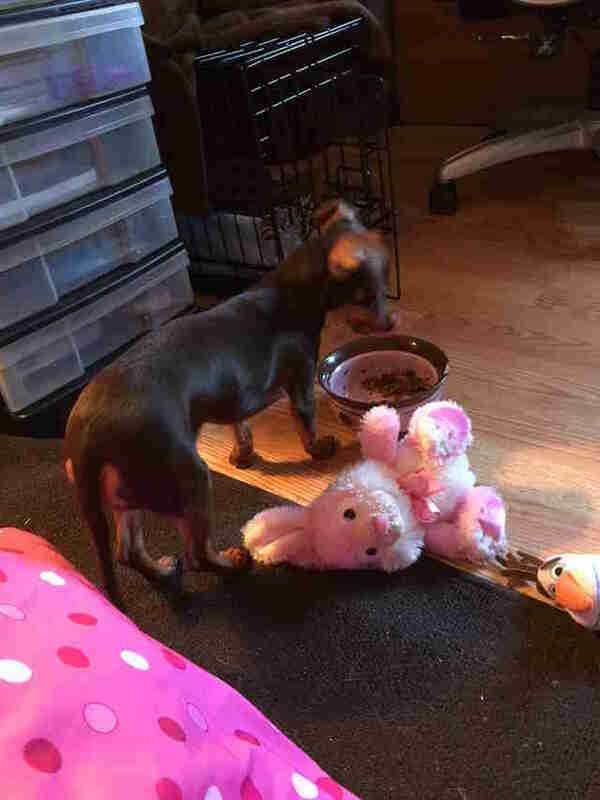 After Dobby beat parvo, she no longer relied on her pink bunny as much. She suddenly had so many new toys to play with and three dog siblings to chase around, but she never forgot her special companion, and has kept a very close eye on it over the years. One day, Coppa came down with a terrible migraine and stayed home from work, bedridden the entire day. Her dogs could sense that something wasn’t quite right with her, especially Dobby. Dobby refused to leave her side and kept the family’s two bigger dogs away from her. She stood by her protecting her all day, probably not sure what else she could do — until she remembered her pink bunny. 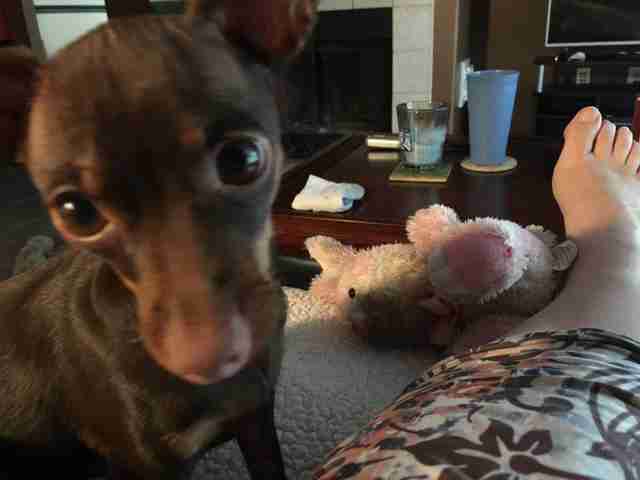 When Dobby had been feeling so terrible because of her parvo, her pink bunny helped her through it — and so she figured that her pink bunny might be able to help her mom through her sickness, too. 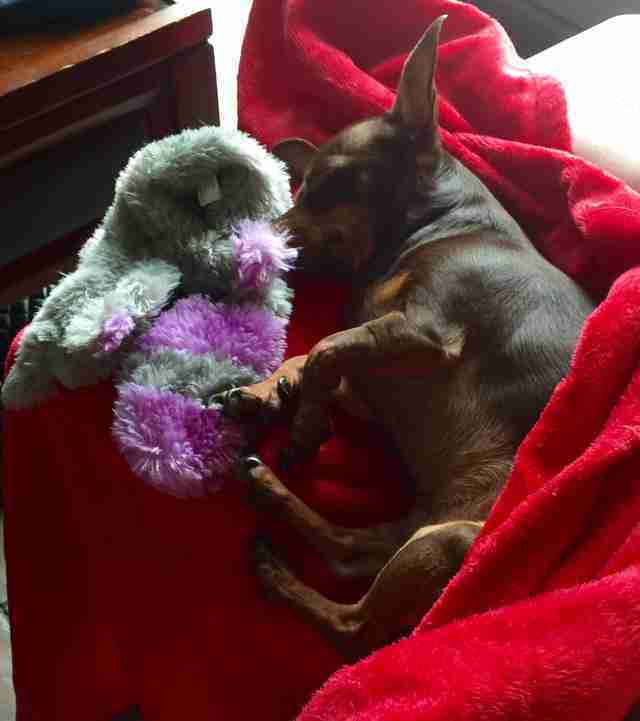 Now, whenever someone isn’t feeling well, Dobby presents them with her precious pink bunny. When no one is sick, she makes sure her bunny is always safe and protected, the same way it protected her when she needed it most.